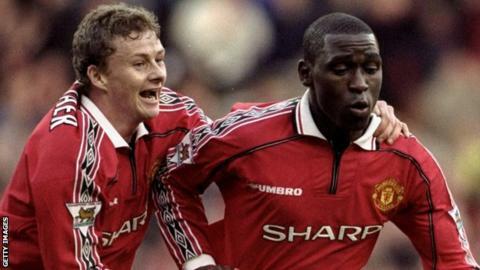 Manchester United should make Ole Gunnar Solskjaer their permanent manager, according to his former strike partner Andy Cole. Since taking over as interim boss in December, Solskjaer has transformed United's fortunes with 10 wins from 13 Premier League games. Jose Mourinho's successor has also guided United to the quarter-finals of the Champions League, a trophy Cole won for the club with Solskjaer in 1999. "I would give him the job," said Cole. "I have been very impressed. I don't think I am different from anyone else. He has gone in, he's galvanised the club. "We all know this is possibly the most important appointment since Sir Alex [Ferguson] left. "We have had three managers in that time. Are we moving forward, are we standing still, and when we are talking about Manchester United finishing in the top four and it's time to celebrate, I am scratching my head. "That's not something to celebrate. It's Man United. For me, you celebrate winning the league, getting to the European Cup final or winning the FA Cup, or whatever." United are fifth in the Premier League table, two points behind Arsenal in fourth place and three adrift of Tottenham in third. Although the Old Trafford club were only one place lower in sixth when they sacked Mourinho, they were closer in terms of points to the relegation zone than they were the top of the table after a 3-1 defeat against leaders Liverpool. United's players, staff and fans had also become unhappy with what was perceived to be a negative style of play and a reluctance to promote youth players. Cole believes Solskjaer - who is contracted to United until the end of the season - has addressed those issues, which worried him during Mourinho's reign. "You have got to be concerned. When you play for Manchester United you become part of the fabric yourself," said Cole, who was speaking at the launch of the International Champions Cup in Cardiff. "Playing for Manchester United you play in a certain way, and when you see Man United not playing that way, you have got to start scratching your head. "I would like to believe that I played in many entertaining teams that scored goals and played the way Manchester United fans wanted us to play. "So when it goes away from that, you are bound to get worried because Man United play a brand of football that everyone talks about and you miss it when they don't do it. "I just think he [Solskjaer] is trying to get Man United playing the way Man United used to play - attractive football, scoring goals and being entertaining. "His staff have had a lot to do it with as well. Bringing Mike Phelan back was essential."